Synonyms: Onagra biennis (L.) Scop. ; Oenothera muricata L.
Other common names: Common evening primrose, wild evening primrose, field evening primrose, tree primrose, fever plant, night willow-herb, king's cure-all, large rampion, scurvish, scabish. Habitat and range: This is a widely distributed herb, its range extending from Labrador south to Florida and west to the Rocky Mountains. It usually frequents fields and waste places, occurring in dry soil. Description: The evening primrose is a coarse annual or biennial weed, which has the peculiarity that its flowers do not open until evening, remaining open all night and closing the next morning, but not expanding again. It is generally stout and erect in growth, from 1 foot to about 5 feet in height, simple or branched, usually hairy and leafy. The leaves are 1 to 6 inches in length, lance shaped and sharp pointed at the top, with wavy toothed margins narrowing toward the base. With the exception of some of the leaves near the base, most of them are stemless. 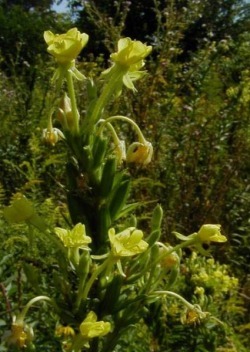 The spikes of fragrant sulphur-yellow flowers are produced from about June to October and, as already stated and as indicated by the name "evening" primrose, they are open late in the evening and during the night. They are borne at the end of the stem and are interspersed with leafy bracts. Each flower has four spreading petals and measures about 1 to 2 inches across. The seed capsules are oblong and hairy, about an inch in length, and narrowed at the top. This plant belongs to the evening primrose family (Onagraceae). Collection, prices, and uses: The entire plant is used. It is collected about flowering time, bringing about 5 cents a pound. The herb has a somewhat astringent and mucilaginous taste, but no odor. It has been used for coughs and asthmatic troubles, and an ointment made therefrom has been employed as an application in skin affections.